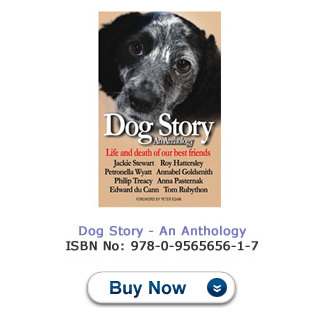 Dog Story is an anthology of eight stories of other people’s dogs. They reflect the life, the death, the extraordinary adventures, the happiness and ultimately the sadness these stories have brought to their owner’s lives. Annabel Goldsmith, Jackie Stewart, Roy Hattersley, Philip Treacy, Roy Keane Anna Pasternak, Petronella Wyatt, Edward du Cann and Tom Rubython tell the stories of their beloved dogs in the heart warming book of the year. Sir Jackie Stewart and Boss: Sir Jackie Stewart, nicknamed The Flying Scot, competed in Formula One between 1965 and 1973, winning three World Drivers' Championships. He founded his own F1 team called Stewart Ford in 1998. The team was sold to the Ford Motor Company in 2001. He is an ambassador for Formula One Sponsors. When his Norfolk Terrier, Boss, died in 2005 Sir Jackie felt a part of his soul went with him. The loss created a void and a sense of emptiness that has never completely been filled. Boss was always rushing around, constantly on the move, he rarely left Sir Jackie’s side from the very day he arrived to his death in 2005. Although Jackie now has two new Norfolk terriers, nothing can replace the gap left by Boss. Annabel Goldsmith and Copper: Lady Annabel Goldsmith is an English socialite and the mother of Jemima Khan and Conservative MP Zac Goldsmith. She was first married to Mark Birley, the founder of Annabel’s nightclub which he named after her. She divorced and later married Sir James Goldsmith. Copper was her faithful companion for over 15 years. Copper had an intelligence that far outshone any lack of blue blood breeding. Copper, a mongrel cross breed, became a living legend in Richmond, West London, and often travelled on the bus on his own between Richmond and Kingston. Copper was well known in the pubs of Richmond, often stood a drink by locals. His travels made him a legend in the leafy borough. Roy Hattersley and Buster: Lord Hattersley is a British Labour politician, ennobled in 1993 when the left the House of Commons. Formerly a journalist in Sheffield he served as deputy leader of the Labour Party from 1983 to 1992. He was inseparable from his dog Buster for 15 years. Regardless of weather conditions, Buster’s persistence would often force his master out into the freezing Peak District rain. Hattersley remembers being woken repeatedly in the middle of the night by Buster’s snoring, which he found oddly irresistible. Buster imposed himself on the lives of all those around him, and he died eating a piece of his favourite blue cheese. When Buster died, the spring went out of his master’s step. Now his master has a new hound and his spring is back. Philip Treacy and Mr. Pig: Philip Treacy is an Irish milliner and one of the 20th century's foremost hat designers. Since moving to England, he has designed hats for Alexander McQueen at Givenchy in Paris and for Karl Lagerfeld at Chanel. He runs his own eponymous label in London. Ascot week is his showcase to the world. Mr. Pig remained by Philip Treacy’s side, day and night, for 12 years. Believing he was human, he used to sit quietly while his master worked. He always seemed to know what Treacy was doing. After a show, when it was just the two of them alone together, Mr Pig would leap up in the air three times to tell his master how much he liked the work. Mr Pig was sensitive, attentive to most things, but he had no trouble sleeping through the otherwise deafening techno music in the design studio during feverish preparations for Ascot week. Petronella Wyatt and Mimi: Petronella Wyatt is a British journalist and author. She is the daughter of the late Woodrow Wyatt. Formerly deputy editor and then a columnist for The Spectator, she now writes for the Daily Mail and is one of the best known writers in newspaper. Mimi suddenly leapt into Petronella’s lap the minute they laid eyes on each other. Mimi was white with sable markings, possessed of huge black eyes, and those famous ears. It was as if God had kissed her on the cheek and there she was, a five-month-old Papillion puppy. The two were inseparable until Mimi died. Till the end, she demonstrated a splendor of the soul: uncomplaining, resigned and loving. Eventually, Petronella found love again with her new Papillion called Minnie. Anna Pasternak and Wilfred: Anna Pasternak is a leading British journalist and writes for the Daily Mail. She is the author of the popular Daisy Dooley Does Divorce. She currently writes the ‘On The Couch’ column in the Daily Mail. She is the great niece of Doctor Zhivago author, Boris Pasternak. Wilfred was her beloved dachshund until his death in 2009 at the age of 20. When he died he was believed to be the oldest dog in Henley-on Thames. Wilfred died as he had lived, beautifully and with dignity. At the end, Anna and her daughter, Daisy, toasted his memory with champagne. Wilfred is still much missed and has never been replaced. Anna loved Wilfred more than any man, and after losing him wondered if she would ever feel a love like his again. Tom Rubython and Harry: Tom Rubython is the author of the hugely successful Life of Senna, the biography of the three-time Formula One world champion, Ayrton Senna. A personal friend of many of the major movers and shakers in Formula One, Rubython is the former editor of F1 Magazine, BusinessF1 and SportsPro magazine. Harry was born on 7th July 2002. She was the first of three cocker spaniel sisters born a year apart who shared the life of author Tom Rubython. Harriet, who was always known as Harry the Hound, was a birthday present in August of that year. Harriet was a uniquely sociable dog whose sole ambition in life was to make friends with everyone she met. Whenever a car stopped at a junction, she would wistfully stare up at the door hoping its owner would alight to greet her.